Discover how tarot cards can help you answer burning question about love and achieve happiness in your relationships. If you want to become a fortune teller yourself and be able to provide tarot readings, we have prepared this basic training program to help you acheive your goal. Use as many steps as you want and in any order (to create your own personal style), although we recommend beginning with the first four steps. Draw at least one card a day, and go through several of the steps below, writing down your insights in a notebook. The next day make notes about what actually happened. For important dates continue adding comments as your insights develop over the years. Step 1 Say the name of the card aloud. Step 2 What number is on the card? What does this number signify (in one to three words)? 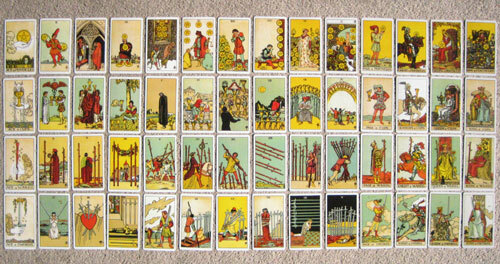 As a Tarot student, lay out all the cards grouped by number. Make lists from books of what each number means and select one to three words that best apply to all cards of that number. Step 3 What suit is the card? Name several characteristics of the suit. Step 4 Put item two and three together in a short sentence or question. Step 5 Simply describe the card as if the other person could not see it. Repeat your description in the first person, present tense. If reading for another you can ask them to do this, or turn your descriptions into questions. Step 6 Describe what seem to be the emotions and feelings of the figures on the card and the mood and atmosphere of the environment. Repeat this description in the first person, present tense. Step 7 Make up a spontaneous story or fairy tale about what is happening in the card. Step 8 Notice any impressions, ideas, or thoughts that come up while doing the above. Ask yourself how these are relevant, then let them go. Don’t become emotionally attached to any of your ideas or opinions as being right. These may be psychic insights, metaphors for a deeper meaning, or your own stuff. If reading for another don’t make judgments about whether something is good or bad. Step 9 Do any expressions, sayings or cliches come to mind as you look at the image on the card? Proverbs can be especially insightful. How do these relate to the situation? Step 10 What are traditional interpretations of the card? Eventually you want to be able to draw on an great field of possibilities. Subsequent cards and the situation will start emphasizing particular segments of that field, thus narrowing down the possibilities. Step 11 Imagine the entire range of card meanings as stretching from most problematic to most beneficial. Give an example from each extreme. See this range of meanings as on a dial or continuum. Move your hand along the continuum until finding where you are now. Next determine where you want to be along the continuum. Is there another card in the spread that supports that? Step 12 If applicable, is this card modified by any other cards in the spread or by being reversed? Note repetitions of suit, number, color, shape, figures, detail, theme, etc. among all the cards. Step 13 Imagine that you are one of the figures on the card by physically acting out the scene depicted on the card. Take your time and really feel yourself in the situation. What are you doing? How does it feel? What do you want or need? Why are you there? Examine, handle and use objects found in the card. Step 14 Close your eyes. Imagine the card becoming life-sized. Enter into the card. Look around you. What do you see? Answer questions such as those in Step 13. Speak as the figure. Step 15 Comment on any beliefs, attitudes, or judgements you think are suggested by the card. Are these appropriate and helpful? If not, how can they be modified or changed? A reader should never make judgments about the situation. However you can may need to acknowledge an apparent situation. Step 16 What does the card have to teach you? If in doubt, ask these figures. Speak the first response that comes to mind. Again, a person should only do this for themselves. Step 17 How do all of the above relate to your life right now? Step 18 What are the qualities that you see in the card that you would most like to develop in yourself? Name those qualities. Turn them into a statement affirming that you already have and are using those qualities in your life right now. 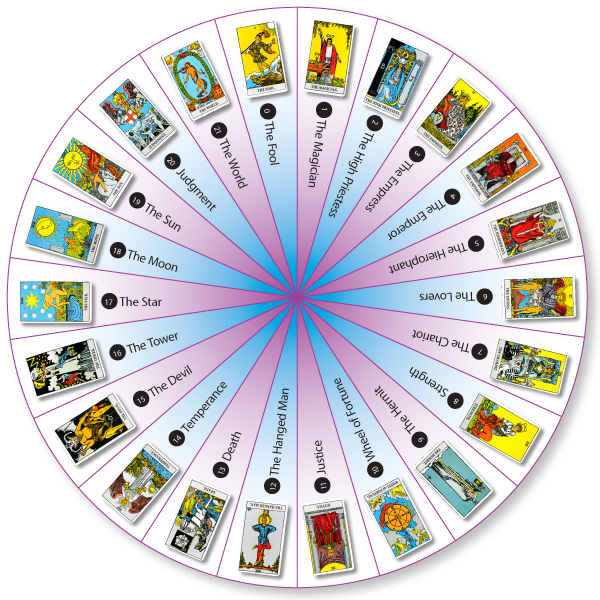 Tarot Cards History what are the Minor & Major Arcana?